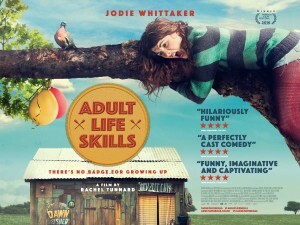 ADULT LIFE SKILLS (formally HOW TO LIVE YOURS) is a comedy feature film starring Jodie Whittaker. It premiered at Tribeca Film Festival 2016 where it won the Nora Ephron Prize. It is released in the UK on June 24th. It is based on the BAFTA & BIFA nominated short film EMOTIONAL FUSEBOX, written, directed and edited by Rachel, produced by Michael Berliner. The film is a Pico Pictures production backed by Creative England with support from Film Väst and the Wellcome Trust. Executive Producers are Jodie Whittaker, Ken Marshall, Richard Holmes, Paul Ashton and Jakob Abrahamsson with Sean Wheelan of Filmgate Films co-producing.